Details: Sausage stuffing cooked inside the turkey. This is the second post in our series about what beer pairs best with Thanksgiving dinner. In the first post we discussed what beer pairs best with turkey. Since we are pairing with the same two beers we’ll skip the beer specific piece and cut right to the food and pairing part of it. You can refer back to the first post about turkey for the specifics on the two beers. The stuffing was awesome. Stuffing is always one of the best parts of Thanksgiving but the fact that this stuffing also had sausage just makes it that much better. The stuffing was cooked in the turkey so it gets that extra crispiness that you just can’t get the rest of the year. How was the Avant Garde with the stuffing? The answer is: great. The stuffing seemed to add some type of spice that really went well with the beer. 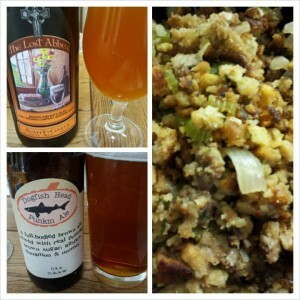 The beer seemed to be even smoother and easier to drink with the extra stuffing spices. How was the Punkin Ale with the stuffing? The answer is: good. The Punkin Ale and the stuffing was good but there really wasn’t any difference in either flavors. The Punkin Ale has so much spice and flavoring of its own that it seemed to not be affected by the food as easily as the Biere de Garde. So, the answer to the original question of what beer pairs best with Thanksgiving stuffing is: Biere de Garde. Try getting some Avant Garde to pair with your Thanksgiving stuffing. Pumpkin Ale certainly isn’t bad either but with the Avant Garde you can experience a slightly enhanced beer with the pairing.